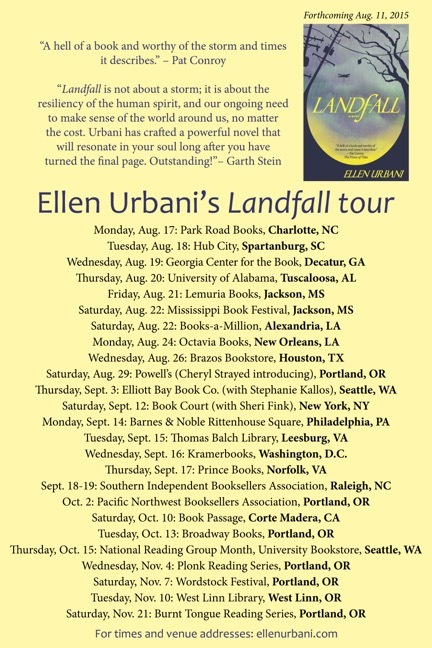 Ellen Urbani, author of Landfall, is being featured by The Huffington Post today in a column on authors who choose to give back, which also includes author Ann Garvin and the Listen to Your Mother show. Read “Writing Well and Giving Back” here to learn more about Ellen’s decision to donate a book to a Hurricane Katrina-ravaged area for every twentieth person who attends a Landfall book event. The latest tour schedule is below.